I've been contacted a few times recently by visitors who weren't sure of the color of their Siamese cats. As each of the cats is a bit different, I thought it'd be fun to put them all together on one page. Thanks to everyone who sent these in - I hope we've been able to help you. 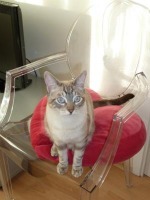 Could this little fella be a tabby point Siamese? I know it sounds strange but actually I am still not sure that my cat is a Siamese. I bought him as Siamese in a store (without pedigree) and each time I go to the veterinarians they tell me it is not true. Can somebody help me? I think he could be a tabby point but ... is it true? Francesca, you bring up some really good points here. Without a pedigree (or at least, knowing the parents of your cat) it's difficult to say definitely whether your cat is a 'true' Siamese or not. In order to be a true Siamese, both parents also need to have been Siamese, and you may not always have this information. But does it really matter whether you know that your cat is Siamese or not? We all love our cats because of who they are, not what they are. I think you're right. Your cat does have the markings of a tabby point (also known in the States as a lynx point Siamese). It's a little hard to see his eye color from the photos. Are they blue? If so, it's very likely that there will be some Siamese in his background. If not, then he may be more of a tabby mixed with a cat of a different breed. He's gorgeous, though, and there's no doubt at all about that! 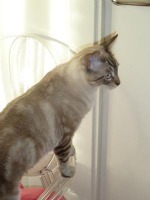 You might also like to take a look at the photos of this tabby/lynx point Siamese mix, sent in by another of our readers, who looks a lot like your cat. I was wondering if someone could tell me what color my Siamese cat Jojo is? I got him a couple of weeks ago from a co-worker of my husband's, who didn't know either. He gave Jojo to me because he is not home much and wanted him to have a good home where he can get all the attention he needs. Jojo is so loving and so beautiful, I love him so much and I miss him when I'm at work. I'm not sure how old he is but he has beautiful color on his coat and although you cannot see his eyes, they are a beautiful blue. 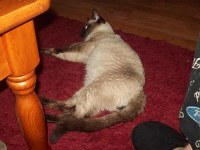 I think Jojo is a chocolate point Siamese, or perhaps a seal point. The way to tell is to check out his paws - if they're dark brown he's a seal point, but if they have a pink tinge to them he's more probably a chocolate point. I know for sure he's a Siamese, but I'm not sure what kind? He's very possessive and gets jealous pretty easily. He is a major sweetheart though, most of the time. I'm the only person out of three that live in my house who he likes! To me, Rusty looks like a flame point (more officially known as a red point Siamese). 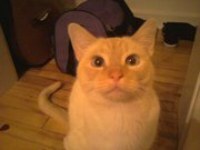 In fact, he looks quite like the cat on the flame point Siamese page. Yes, Siamese cats truly are sweethearts, but they can also be a bit jealous and possessive at times! We got this handsome li'l boy from the pound. We don't know if he is in fact a Seal Point or not? The pound where we got him wasn't sure either. Here he is at roughly six months old, when we first got him home. 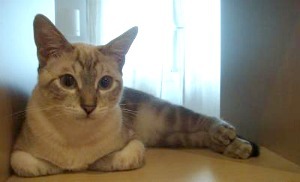 And here he is one year old and has the most beautiful blue eyes with dark ears, tail and feet. He has dark pads on all four feet. He cries just like a human newborn baby - not a regular meow. Our neighbors thought we had a newborn in the house - LOL! Because of the lighting, Simba looks two different colors in the pictures, so it's a little difficult to tell, but from your description I think you're right and he's probably a seal point. Check out the pictures on those pages and see which one you think he's most like. If his points are dark brown, then he's a seal point, but if they're dark gray, then he's more probably a blue point. My daughters have found an all white Siamese kitten with the dark nose and tail, blue eyes, even all white feet. I know that all are born white and had several, even still have two seal point females (Suzy n Sophie) my question is what kind could this be? I'm stumped on this but I plan on keeping it. Any help would be appreciated. My cat Penny looks like a blue tortie but has beige fur that is very fluffy almost long hair but not quite. Her face, ears and tail are dark grey (her tail being almost black), with Tortie patches but her nose is gray and her paws are spotted gray and pink. She also has ice blue eyes, what do you think? Reply from Caroline: She certainly sounds like a Blue Tortie, although with her long fluffy hair it sounds as if she may look more like a Balinese or Javanese cat, which are both breeds that grew from the long-haired kittens sometimes found in Siamese litters. My Blue Point female Siamese just gave birth to four kittens today by my Chocolate Point male Himalayan. They are mostly white but look like they have a little darkening around the ears. What color do you think they may be and do you think they will have long hair? 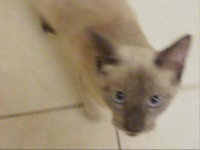 I have a 14-week-old Chocolate Point Siamese. Her eyes appear almost white at times. 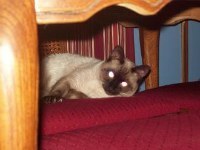 All of the other Siamese cats we have had, have had the vibrant blue eyes. Will her eyes darken? I check Jojo's paw pads and they do have a lil tinge of pink on them, so that means he is a chocolate point and Thank You so much for your help!!! !